20 minutes from skiing at Mt. Bachelor and 8 minutes from downtown Bend, Tetherow Lodges is fast becoming known as one of the best places to stay in this world-class recreation area. The lobby, rooms, and restaurant are luxurious but unpretentious, offering a mountain lodge like ambiance with gorgeous views of the mountains and ponderosa pine forests. Almost all the rooms have fireplaces, and corner rooms have big windows letting in natural light. Chocolate made in Bend accompanies the fine coffee and tea, bathrooms are spacious with oversized fluffy towels, and beds come with a pillow menu and euro-style comfortors suitable for the mountain lodge atmosphere. Tetherow Lodges is Dog Friendly, and dog-understanding: book a dog friendly room and your pup gets her own doggie beer, and there's an outdoor washing station for post-trail scrub downs. Soloman's, the hotel's fine-dining experience, serves locally-sourced gourmet food Oregon is famous for such as elk, pheasant and coastal seafood. Find the perfect pairing from the extensive collection of West Coast wines. Top it all off with a stunning sunset. For a more casual option, check out The Row. The pub features an aprés ski menu and a featured local brewery every month. Don't miss the Bleu Diamond Burger! If grab n' go is more your style, the Cafe has fresh options to fuel-up on the fly! Looking for alternatives to the links? Look no further than the state-of-the-art fitness activities at Tetherow Sport. This is no hotel-gym -- it's a full facility dedicated to health and wellness. A heated outdoor pool, hot tub and multiple fire pits mean you'll have plenty of space for rewinding and relaxing under the Oregon sky. 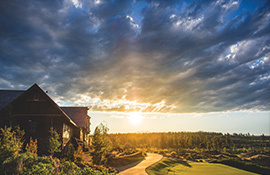 Tetherow Lodges is an 8 minute drive from downtown Bend and 20 minutes from Mt. Bachelor. A free shuttle takes you to town, and there's a twice daily shuttle to Mt. Bachelor ($10). Cancel by 48 hours prior to arrival. Let Tetherow Lodges create the perfect blend of sophistication, elegance and warmth to match the personality and style of your organization. Offering seating for up to 250 guests, and 400 in a social setting, the staff will be delighted to customize any aspect of your event to better suit your needs and desires.